“Barbicane had set his chronometer to within a tenth of a second of engineer Murchison’s; this latter was responsible for lighting the powder by means of an electric spark. By this means the travellers enclosed in the projectile could follow with their own eyes the impassive hand that would mark the exact moment of their departure”. Jules Verne, From “The Earth to the Moon”. Inspired from Jules Verne’s 1865 novel “From the Earth to the Moon”, the limited edition Jules Verne Instrument 1 & Instrument 1wristwatches boast two world firsts. The first is a revolutionary technical solution for starting and stopping a chronograph; this patent-pending mechanism provides fool-proof security when using the chronograph. The second is the inclusion of an authenticated piece of lunar rock in the side of the case at 9 o’clock. 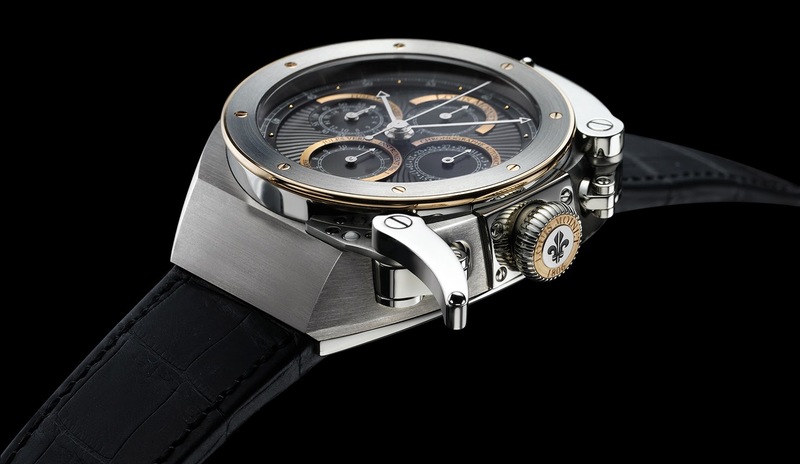 AN INVENTION : A new way to use your chronograph. 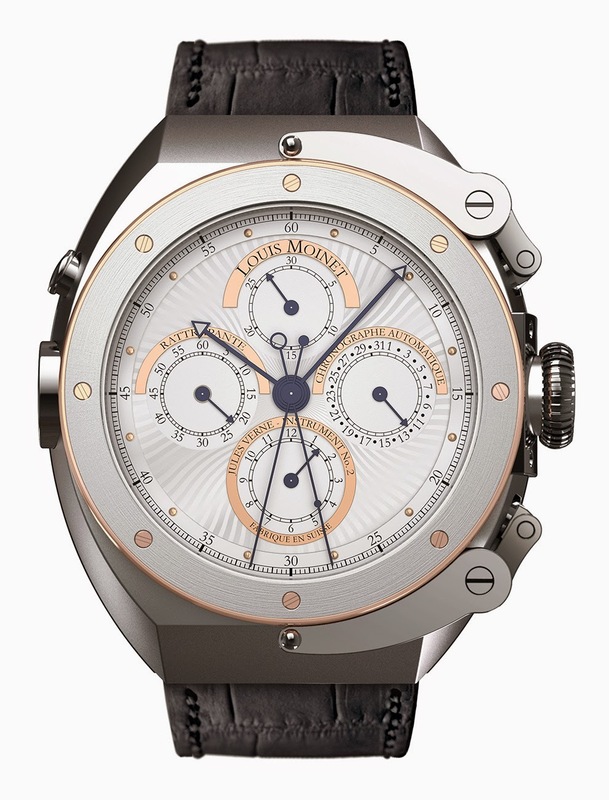 Louis Moinet has invented an advanced technical solution to start and stop the chronograph. This device offers the advantage of fully securing the handling of the chronograph. 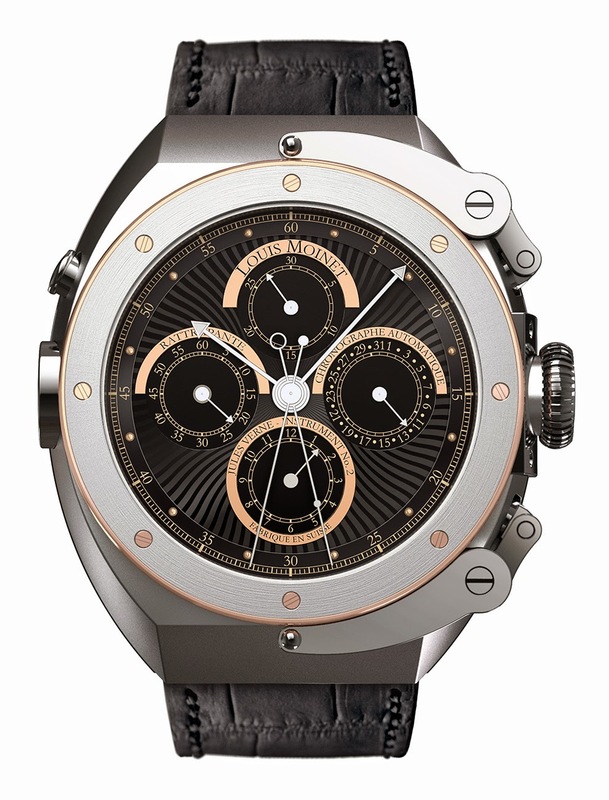 A Real Piece of the Moon : Following Magistralis and Datoscope, the Jules Verne line is the first limited edition in the world to use a real piece of the moon. This lunar meteorite is presented in a porthole at 9 o’clock. 1. A new conception to activate the chronograph function. 3. Case:Titanium Grade 5 & 316l stainless steel & 18K rose gold 5N. 4. 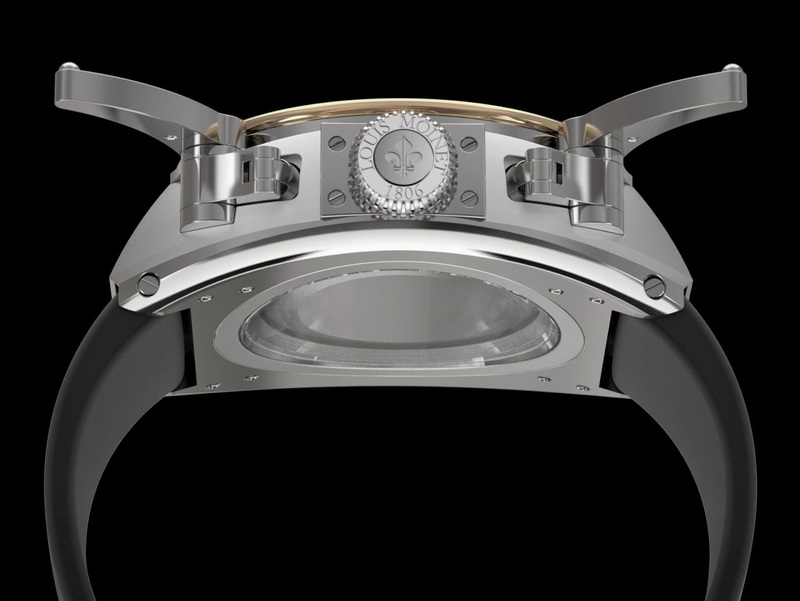 Hands design has been inspired by the work of louis Moinet. 2nd time zone by hand (at 9 o’clock). 3. 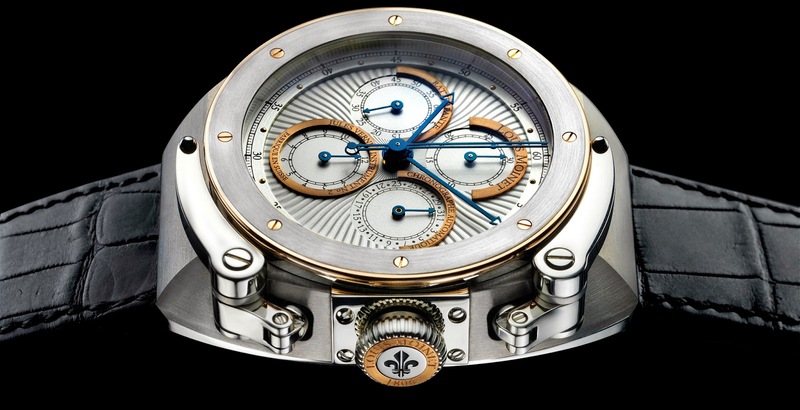 Jules Verne watches have been conceived with the idea that Jules Verne’s heroes could have worn them. 4. Case:Titanium Grade 5 & 316l stainless steel & 18K rose gold 5n. Titanium Grade 5 & 316l stainless steel & 18K rose gold 5n. Jules Verne’s Inspiration: Jules Verne (1828-1905) was widely travelled, readily inclined to be fanciful, and above all a true writer who is among the world’s most translated authors. Jules Verne’s plan was to “depict the whole earth”. To achieve this, he had to contemplate all the knowledge of his day. Moving through a century of changes for which he became the ideal spokesman, he followed a specific programme for modern mankind’s appropriation of the space that surrounds it. Following in Jules Verne’s footsteps is not merely paying homage to an extraordinary storyteller; it also means being inspired by his thirst for discovery and his tremendous intellectual ambition. A world first by Louis Moinet – A real piece of the moon, Dhofar 459 is a lunar meteorite that was ejected from the moon 2,000 years ago. The meteorite, which has been authenticated by the university of California, actually added to our knowledge of lunar geology, since it came from a place that the Apollo missions did not visit. Moon stone is an extremely rare material that is even more expensive than gold and platinum combined. 500 millions years ago, a first asteroid impacted the Moon. Then, a second asteroid impacted the moon at the same place, circa 2,000 years ago, giving birth to Dhofar 459. Dhofar 459 was accelerated by this asteroidal impact and escaped the Moon’s gravitational influence. After a journey of unknown duration, it became captured by the earth’s gravitational field and eventually landed on earth, in the Desert of Dhofar (sultanate of Oman). How do we know that it comes from the Moon ? Dhofar 459 has been analysed and classified by A. Rubin and Paul Warren, Institute of Geophysics and Planetary Physics, university of California, Los Angeles. Chemical compositions, isotope ratios, minerals, and textures of the lunar meteorites are similar to those of samples collected on the Moon during the Apollo missions. Taken together, these various characteristics are different from those of any other type of meteorite or terrestrial rock. Lunar meteorites are meteorites from the Moon. In other words, they are rocks found on earth that were ejected from the Moon by the impact of an asteroid or possibly a comet. After orbiting the moon for a long time, they were eventually captured by earth’s gravitational field, and fell to earth as solid objects. 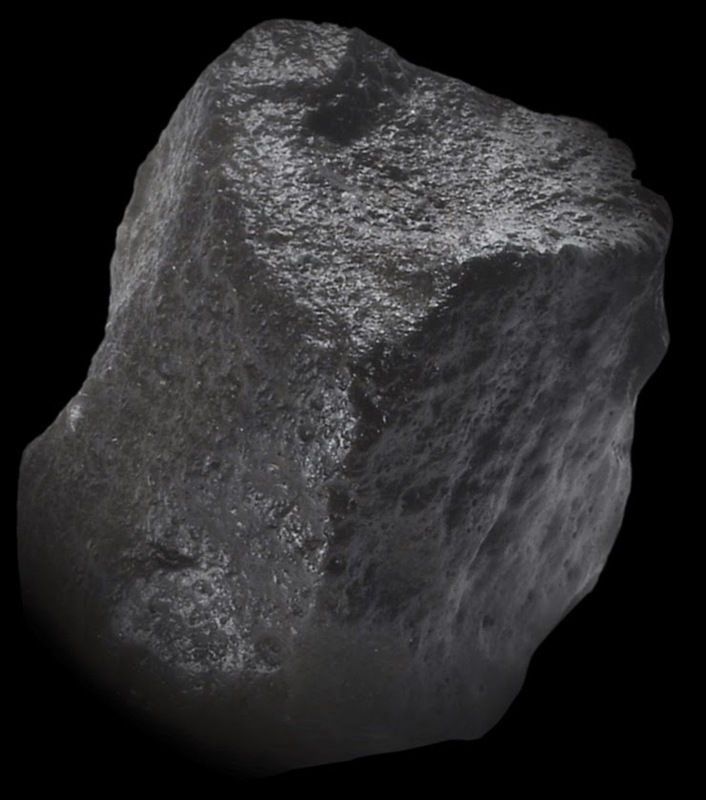 Lunar meteorites are exceedingly rare nearly all meteorites are pieces of asteroids. Only a few rare meteorites come from the Moon.